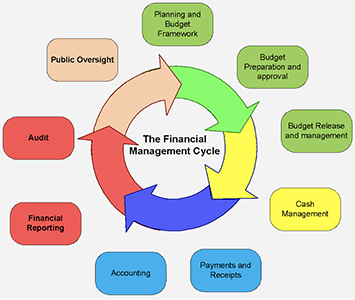 The Public Accounting System (PAS) used by the government, System Application Product (SAP) facilitates all stages of the financial management cycle starting with planning and setting the budget framework, through to reporting and review of the outcome of the budget. The Public Accounting System (PAS) gives a better, accurate and timely financial information as most of the government’s financial transactions are recorded. It enables the government to publish financial reports and provides greater transparency of the financial information. It improves fiscal and financial management and provides better cash flow management through the Treasury Single Account (PBA), enabling the government to be more effective in maintaining financial discipline. It narrows down the chances for corruption and the access to accounting information provides opportunity for more informed financial and managerial decision making. The system has also helped in transition to proper book keeping and accounting through standard operating procedures and standards like International Public Sector Accounting Standards (IPSAS). A centralized payment process is maintained with the use of System Application Product (SAP). All government payments are made from a single Treasury Account (Public Bank Account) managed by the ministry. The invoices are sent by the respective government agencies to Treasury and Public Accounts Division via Public Accounting System (PAS). These invoices are entered and posted (created and authorised) through SAP. During this process, the responsibility of the posted documents solely lies with the responsible officers. Finally, the payments are processed centrally by Treasury and Public Accounts Division. The linkage with Materials Management module in the Public Accounting System enables automatic check against purchase orders and goods receipt. The centralized payment system includes a specialised module for Human Resources and Payroll. 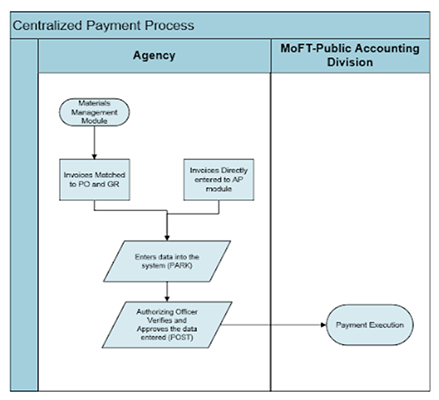 The organizational structures maintained in the Public Accounting System is kept in alignment with the actual organizational structures of the government agencies. Employee records are kept in real time in alignment with organizational structures so the financial reporting remain timely and accurate. The Human Resources and Payroll module enables the following functions. Currently, local council finances are partly managed through the Public Accounting System, with only monthly budgeting being recorded in the system. However, the councils are required to record all their financial transactions as per the Public Finance Regulation (PFR). Accounts are opened and maintained by both the Public Finance Act and the Decentralization Act, the latter that gives the councils the rights to open and maintain an account. The councils maintains their financial transactional records manually on books but through an initiative by the Local Government Authority, a council finance module have been developed which have been hosted on the government network. Currently the module has not been rolled-out to all councils. The Auditor General’s Office and the Ministry of Finance and Treasury are assisting to complete the roll-out of the module to all the councils. Asset management is a key component of the Treasury. Asset management includes; compilation, upkeep and valuation of all the state-owned lands and fixed assets in the Maldives and overseas; ensuring that all the acquisitions, maintenance, and use of the government’s assets are in accordance with the Public Finance Act 2006 (PFA) and Public Finance Regulation (PFR). Loan management is another key component of the Treasury. Loan management is governed by the Public Finance Act. The issuance of the subsequent loans are coordinated with the respective and relevant authorities’ and professional bodies. Government liabilities incurred from the loans are recorded in the Public Accounting System.